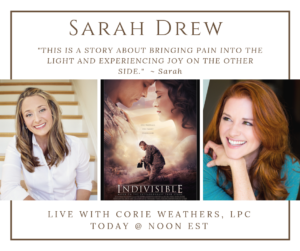 Corie Weather’s interview with Sarah Drew was very authentic. It really connected the issue of pain and suffering, grief with service life. Sarah was vulnerable about her own grief with leaving one phase of her work with Grey’s Anatomy to move into a different and wonderful season of her career and life. She talked about how the “in between” of waiting and slowing down was difficult for her because she loves staying busy with work but saw it as a great opportunity to take care of herself and spend time with her family. Corie mentions the fear of the unknown within this period of waiting, not knowing what is coming next and relates it to military and first responder spouses’ experiences with military and service cultures. Corie explains that we as service spouses are faced with the “in-between” of waiting and the uncertainty of what is coming next with the ongoing work of serving the military mission and local community. She states for service spouses, finding the time for self-care is very difficult while balancing the demands of service life and family. They talked about a very emotional scene Sarah plays as April in Grey’s Anatomy and how powerful that was from a faith perspective. Sarah explained she was able to help shape the role of April with writers and she felt personally connected out of her own experience as growing up as a pastor’s daughter. She said this role was very important and she felt great responsibility to represent April well from a Christian perspective as a loving human of faith. She explained, when it comes to pain, God is not indifferent to our pain and suffering and we have a brother in Jesus who knows and has experienced suffering just as we do. She went onto to say, as people of faith, suffering is guaranteed. Corie connected this with the Christian protestant community explaining that people have an expectation that choosing to live out faith means life will be easier but in actuality suffering is our reality and something we must embrace in order to grow and mature in our faith. Sarah then talks about how this scene from Grey’s Anatomy with April and this patient who is dying had a tremendous impact on people of faith in her community. She goes onto to talk about how she loves being a bridge builder and loved seeing how this particular scene really brought people of different faith backgrounds together. Sarah talked about how her work in this film really hit home for her because she related it with the struggles she has had in her own marriage, how internally she silently struggled and how therapy shed light on the pain and helped her and her husband work through it to heal as a couple. She talks about how fear and shame hold us back from shedding light on our inner pain and suffering in the same way Heather struggled in this film. Sarah explained how she had always searched for a role in which she could tell her story of struggle and this was it for her. Corie went onto talk about this is especially relevant for Chaplain and Leadership couples within the military culture. She talks about how when she became vulnerable about her marriage struggles that people were amazed to discover she struggled with the same things they did and that sparked conversations about how Commander Couples may struggle as well. The kitchen scene was especially realistic and authentic for many military and service couples. They close the interview with Sarah talking about her experience as a pastor’s daughter watching her parents struggle in their marriage and have difficulty with being vulnerable about that out of the fear of being judged. She realized that being vulnerable in her role as Heather, the Chaplain’s wife, was so powerful in that it allowed her to let other people see that struggle and pain. This film is truly the story of our military and service families and their inner struggles from the sacrifices of military and service life. As a chaplain’s wife watching the film with my husband, an Active Duty Air Force Chaplain was powerful. It really hit home in many ways. In fact, even before I had the opportunity to prescreen the film, my husband and I were watching this particular interview over lunch at his favorite restaurant and this was at a point where we were struggling with reintegrating from his recent one year overseas assignment and subsequent PCS. We both listened intently as Corie and Sarah talked through the interview and when they brought up the kitchen scene my husband asked what it was about, as he had not seen the trailer. I described it to him in vivid detail as I began to cry in the middle of that restaurant, because this was our story too. He began to cry and told me “I’m not that guy.” This was the beginning of a turning point for us in the chaos of our “in-between” reintegration experience. We started giving the other the opportunity to understand the other person’s experience without judgment which brought us closer as a couple. We have always been friends but now we were back to being close as best friends. I have also felt the struggle with being vulnerable as a chaplain’s wife. I have chosen to be very open about my life and my struggles and have felt judgment for this. I think this is something that many chaplain and pastor’s spouses experience. From my perspective, the reward of seeing people come to healing is worth the fear and pain of being judged. The reality is, judgement happens all the time, whether we are vulnerable or not. However, being honest about our pain and suffering, no matter who we are, is something that transcends all of that. It is the power of being in community and growing together. THIS is the most important part of all, my friends. I hope the message of this interview and the film INDIVISIBLE encourages you to step out of your comfort zone to bring you and the people in your community to a place of healing.